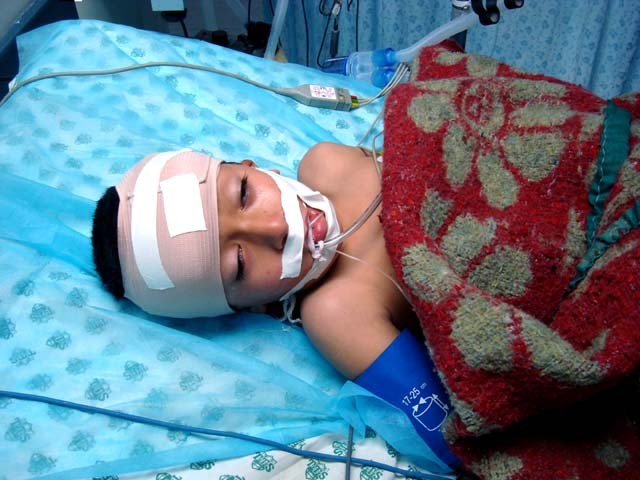 *7 year old Ahmed Hassanin, shot in the head outside his home by Israeli soldiers from Gaza’s eastern border, January 22nd. On the 5th morning after Israel declared a ‘ceasefire’, Israeli gunboats began shelling, as they had on several mornings since halting the 22 day air and land bombardment of Gaza. The shelling, which began just after 7:30 am off Gaza city’s coast, injured at least 6, including one boy with shrapnel in his head. Yasser Abed, 15, came out from his home in Gaza’s Beach camp, on the coast, to see where the shelling was occurring. A shard of shrapnel lodged in his forehead. Nisreen al Quqa, 11, was out earlier, before the navy began to fire towards Palestinian fishermen. She and her brother were walking on the beach when the firing started.A piece of shrapnel lodged in her right calf muscle. Other injuries included a 14 year old male who was hit in the thigh by one of the shrapnel fragments, a 35 year old male also with a shrapnel injury, and a 4 year old girl with a head wound from flying shrapnel. To the east of Gaza city, in the Sheyjaiee district close to the eastern border, also on the same day, 7 year old Ahmed Hassanian was outside his house with friends around 9:45 am. He lies now in critical condition in Shifa hospital’s ICU, a bullet still lodged in his brain and with such brain hemorrhaging and damage that he is expected to die shortly. Mu’awiyah Hassanain, the director of Ambulance and Emergency Services, reports shelling in the northwestern coastal area of As Sudaniya on the same morning, saying five fishermen were injured in the attacks. Israeli warplanes, on the first day of the ceasefire, flew extremely low and loudly over areas of Gaza, leaving residents expecting the worst.Drones capable of photographing and of dropping lethal, targeted missiles, continued to circle in Gaza’s skies for the first 3 days after the tanks retreated and the air-bombing ceased. At 8:30 am, one of these drones dropped 2 missiles in the Amal area east of Beit Hanoun, wounding a woman and an 11 year old child, who later died of her injuries. The Palestinian Centre for Human Rights (PCHR) reports further violations of the cease-fire. At 10:40, Israeli troops killed Maher abu Rjaila, 23, shooting him in the chest as he walked on his land east of Khan Younis city. Two days later, at 1:00pm, Israeli soldiers fired on residents of Al Qarara, near Khan Younis, shooting Waleed al-Astal, 42, in his right foot. Israel’s assault on Gaza has killed at least 1, 330, with as many as 200 more bodies expected to be recovered from under the rubble of the over 5,000 destroyed houses and 20,000 buildings. 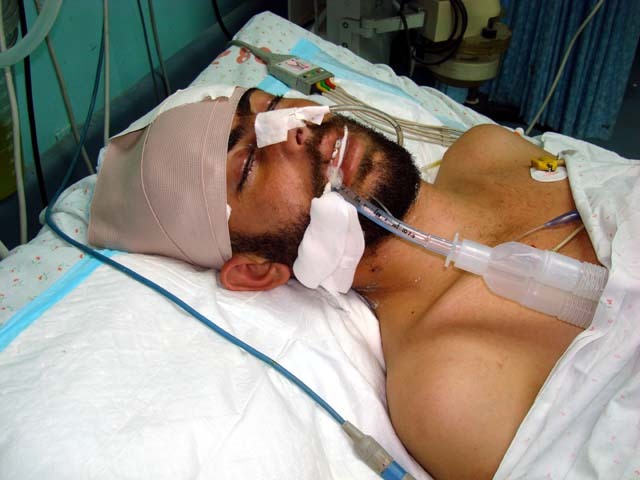 Dr. Fawzi Nablusi, director of Shifa’s ICU, said that of the cases in Shifa’s ICU, 90% were civilian, of these 50% were women and children.One of those civilians injured the day before Israel’s ceasefire was Mohammed Jarboua.Also from the Beach camp, the 21 year old is clinically brain dead, surviving only on mechanical life-support, after being shot in the head by Israeli naval forces. 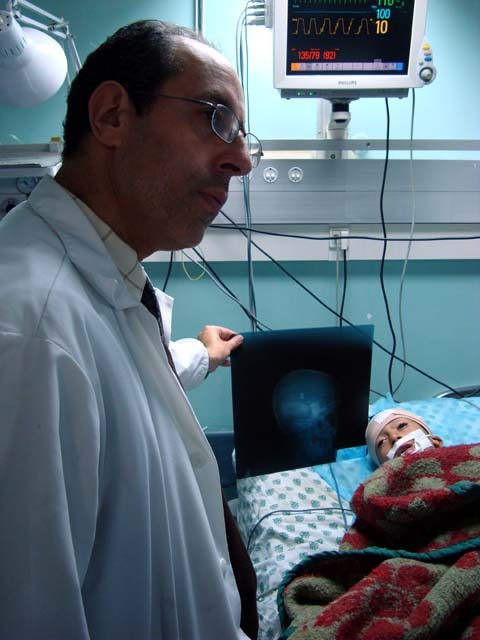 The Director of Shifa hospital, Dr. Hassan Khalaf, and Mu’awiyah Hassanain confirmed that since the ceasefire began on January 18, three more Palestinians have been killed, and 15 more injured, 10 of those injured on January 22nd. These ceasefire violations are not a new precedent, as during the 6 month ceasefire which began on June 19th, Israeli forces routinely targeted and fired upon fishermen and farmers along Gaza’s eastern and northern borders, injuring 62, according to Palestinian sources.During this period, 22 Palestinians were also killed, many of them members of resistance groups, and 38 fishermen and farmers were abducted. The truce period saw border crossings mainly closed, completely sealed them from November 4, 2008 with only the briefest of openings. As the dust settles and noxious chemical fires continue to smolder, Gazans focus on their immediate needs: housing, food, and in many cases locating lost family members still under the rubble. The root of the problem continues: the nearly 2 year old siege on Gaza, not relaxed under the 6 month ceasefire as agreed, and which had already decimated Gaza’s health and sanitation infrastructures, and had shattered the economy.From the ruins of Gaza, any signs of an end to the siege are far beyond the broken horizon. 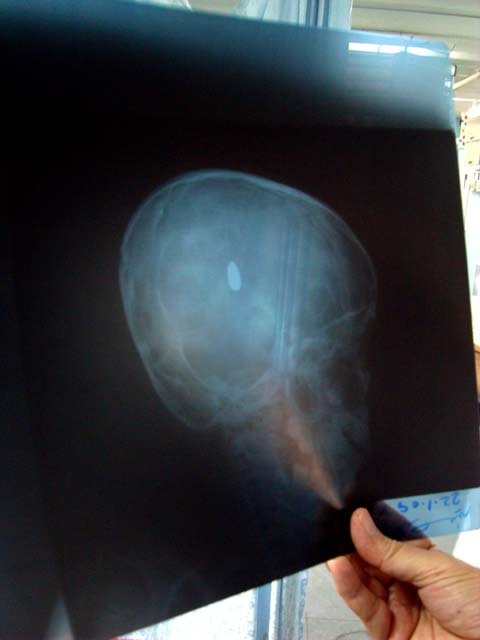 *bullet lodged in Ahmed Hassanin’s brain. 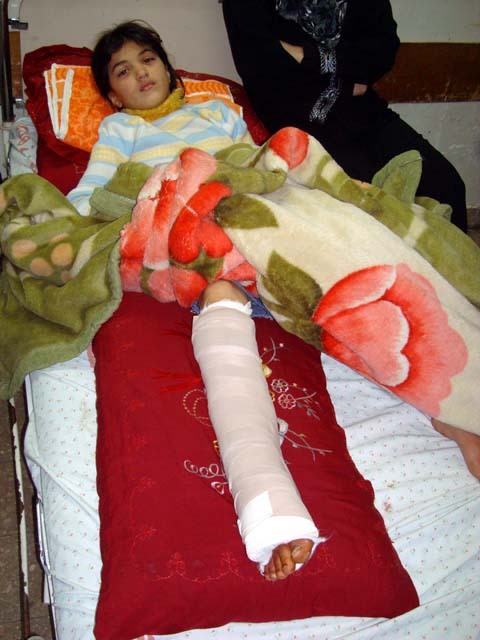 *11 year old Nisreen al Quqa, hit with shrapnel from Israeli shelling on January 22nd. 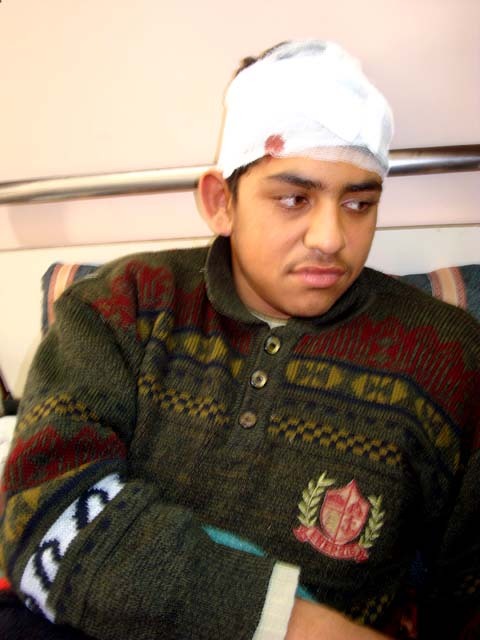 *Yasser Abed, 15, shrapnel to the head from Israeli gunboat firing, January 22nd. *Mohammed Jarboua, 21, clinically brain-dead after shrapnel from Israeli gunboat firing on January 17th. This is how the Israelis conduct their “seige fire”, as far as I can see they arn,t letting in aid either …so that if Hamas fire rockets again , they will blame Hamas for breaking the cease fire , just as they did last time . Also the Egytian intelligence service is questioning the patients who have been treated in Egypt , which I,m sure is illegal.